Kyiv may give Russia a political and legal argument if it engages in dialogue. 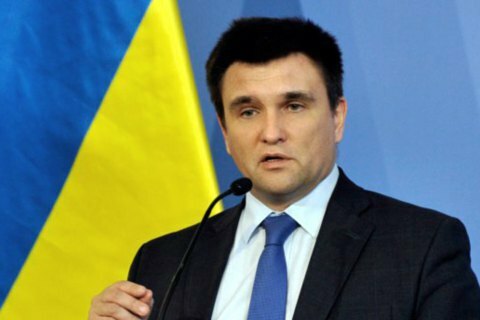 Ukrainian Foreign Minister Pavlo Klimkin has said that Ukraine will not not do anything which can undermine its political or legal position on occupied Crimea. He made this statement at a joint news conference with Albanian Foreign Minister Ditmir Bushati, when he was asked about Russian President Vladimir Putin’s proposal to return arms and military hardware from temporarily occupied Crimea to Ukraine, according to LB.ua. “If you take international law, there is the well-known Hague Convention of 1907. It says that arms can be returned after normal relations and peace are restored," he said. "If Russia is to use the very fact of any dialogue about a possible return of weapons, while we have no idea about the types of weapons or their condition, this will become a political and legal argument for it [Russia]. We will not allow this to happen by definition. This is an example why our political and legal position is so important,” Klimkin said. In January 2018, Putin said that Russia was ready to transfer military hardware from occupied Crimea to Ukraine. It is in a "miserable condition", he added.